Elod Beregszaszi creates paper pop-ups based on a technique developed by Japanese architect Masahiro Chatani. 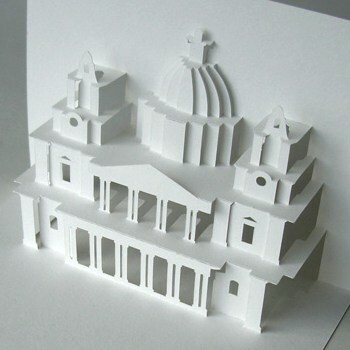 This pop-up of St. Paul's Cathedral is a free sample of Elod's work which may be downloaded as a PDF. St. Paul's Cathedral is a well known landmark in London, England which stands on the highest point in the city. 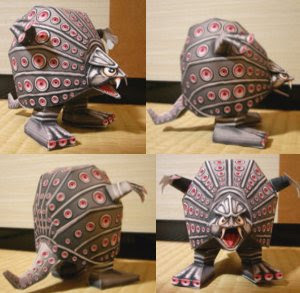 Takkongu is a giant monster who plagues the city of Tokyo in the Ultraman Returns television show. Takkongu is covered with octopus-like suction cups and is sometimes referred to as the "oil monster" due to his fondness for drinking crude oil. This simple papercraft model of Takkongu was designed by Ozasikiwarasi and may be downloaded here. Agence Eureka continues to post delightful papercraft from past decades. 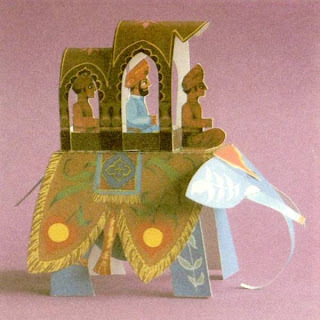 This simple paper toy is entitled "L'Elephant Du Maharadjah" (English: The Elephant of the Maharaja?). I am not sure how old the toy is, but the graphics have a 70's feel to me. The two pages of the template for the elephant may be found here and here. Meta Knight is the sometimes ally, sometimes enemy of Kirby in Nintendo's Kirby series of video games. Meta Knight first appeared in Kirby's Adventure released in 1993. This papercraft Meta Knight mask by Objsolid comes in both 10" (25.4 cm) and life size versions. The Pepakura PDO templates for the masks may be downloaded here. 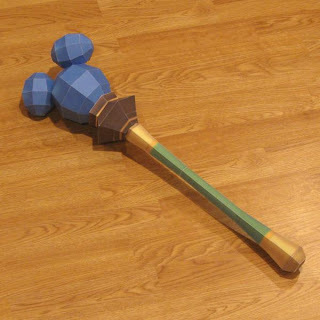 After completing a papercraft Dream Sword from the Kingdom Hearts II video game, I set my sights on producing paper models of the other two "dream" weapons from the game. Here at long last is another one in the set: the Dream Rod. 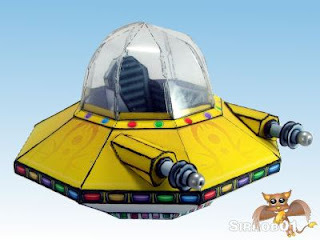 The Dream Rod is a mystic weapon and as such it is wielded by Donald Duck, who in the game is the Royal Magician. If you observe the Dream Rod during game play its seems to be about baseball bat size, but for this model I chose to make it closer to "magic wand size" at around 24" (61 cm) long. The PDF template for the Rod may be downloaded here. In case you missed the Dream Sword papercraft, it is located here. "Totem figures are not Gods. 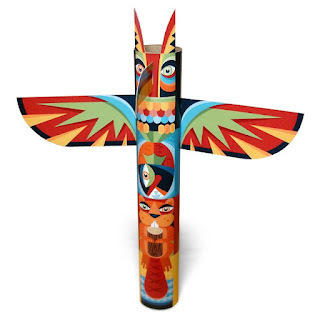 Totems are not worshiped like religious icons nor used as a talisman. They were never used to ward off evil spirits and claims of bizarre, magical "totemism" practices are fiction. A totem pole may be compared to the symbolism portrayed in the Great Seal of the United States or a Coat of Arms. These national emblems are roughly equivalent to the meaning bound up in a totem pole except they identified clans not an entire nation." This papercraft totem pole was designed by Glitschka Studios who have offices in the Pacific Northwest and who have found inspiration in the local culture for their illustration work. 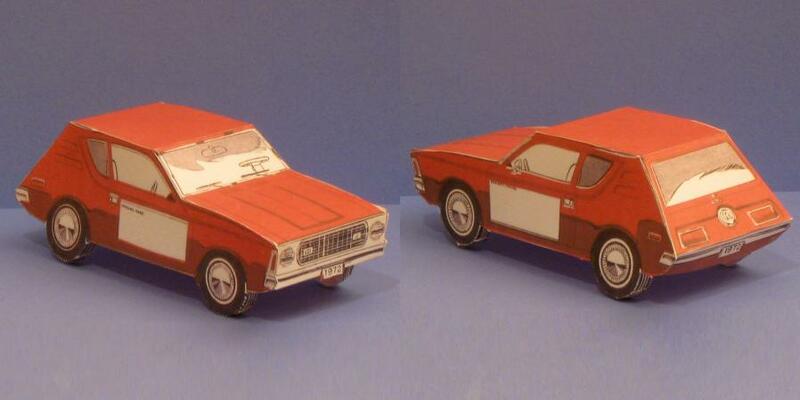 This papercraft car is a promotional item produced by the now defunct American Motor Company to introduce their 1972 Gremlin automobile. A line of text on the template proclaims, "Cut out and build a Gremlin, then come in and we will put you in the real thing." The white boxes on the sides of the car are where the car dealer's contact information was to be printed. 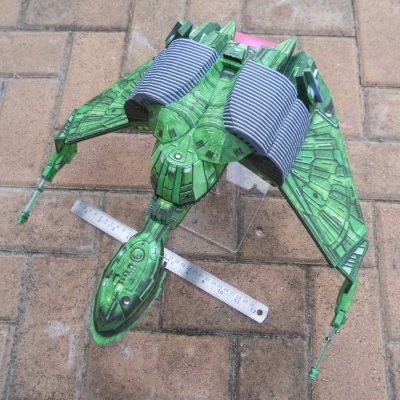 A scan of the template for the Gremlin is located here. Black Star Toy has a paper toy assortment of some of my favorite female characters from Marvel Comics. From left to right are Mystique. Psylocke, and the Scarlet Witch. Each of the characters has played a significant role in the X-Men titles, with the Scarlet Witch being a member of the Avengers as well. Black Star Toy also features paper toys of celebrities done in a similar style. I think this paper doll thing is growing on me. 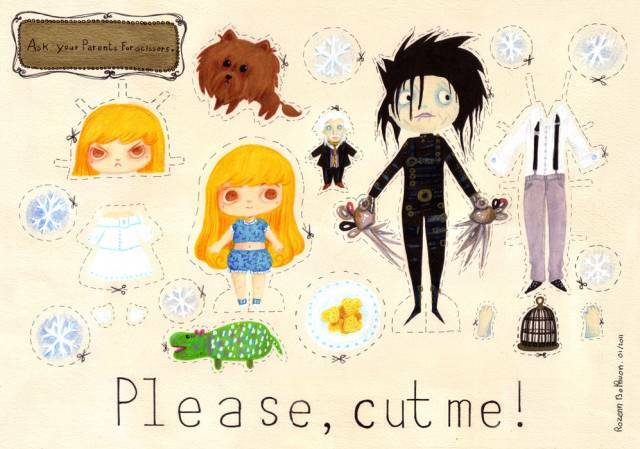 ^^ These paper dolls were created in 2011 to commemorate the twentieth anniversary of Tim Burton's movie, Edward Scissorhands. If you look closely you will recognize all sorts of props and characters from the movie. This art is the work of illustrator Rozenn Bothuon and may be downloaded here. There seems to be an abundance of Fantasy themed paper model helmets around these days. Here is another one to add to the tally. 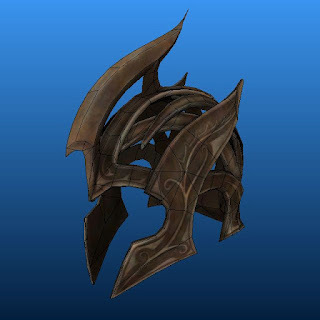 This LOTR Elf helmet by Movieman has a unique open design. From its looks, I assume that this papercraft is based on a 3D model from one of the many of the Lord of the Rings video games. 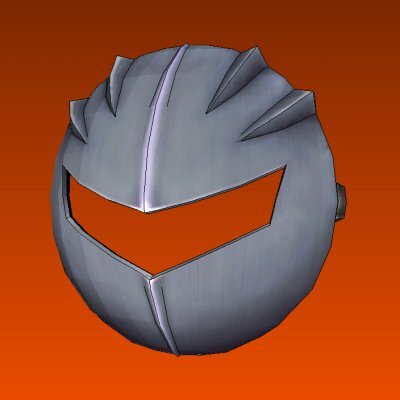 The Pepakura PDO template for the helmet may be downloaded here. The Cubeecraft website now has a side project of pop-ups called "Pixel Pages". 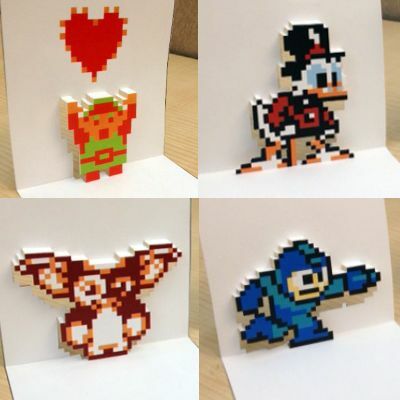 As you might expect from the title, these pop-ups primarily feature classic 8-bit video game characters, however other pop culture characters in pixelated form are available too. Pictured above are Link from Legend of Zelda, Disney's Scrooge McDuck, Gizmo from Gremlins, and Mega Man. Templates for all 32+ characters may be downloaded here. The female character Chun-Li first appeared in the Capcom video game Street Fighter II. She has appeared in every Street Fighter game since, as well as the Marvel vs. Capcom series of games. 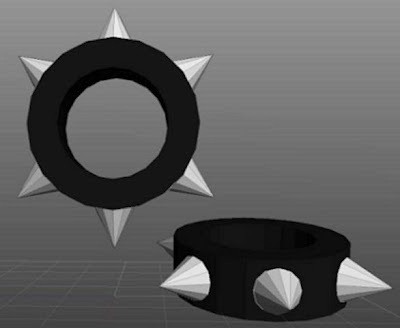 These full size paper models of Chun-Li's iconic bracelets were created by "ishi kami no kusuri". For those of you who were hoping for more Half-Life papercraft, here is a little something until I can put together something more elaborate. 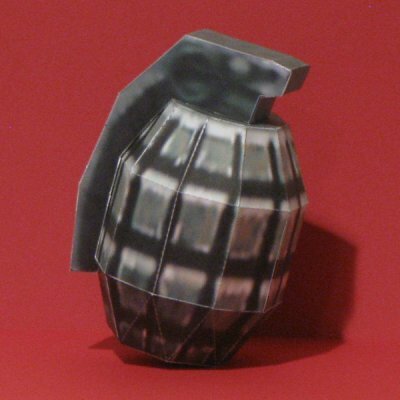 This is a paper model of the Mk2 grenade that appears in the Half-Life 1 video game (as you might gather from the delightfully pixelated textures ^^). At only four parts, it is a simple build. The PDF template for the grenade may be downloaded here.